Phase 10! Dice Game - Advance to the next phase in this roll and score dice game with a twist. The Phase 10 Dice Game is a colorful variation of the popular original Phase 10 Card Game. You'll love Phase 10. 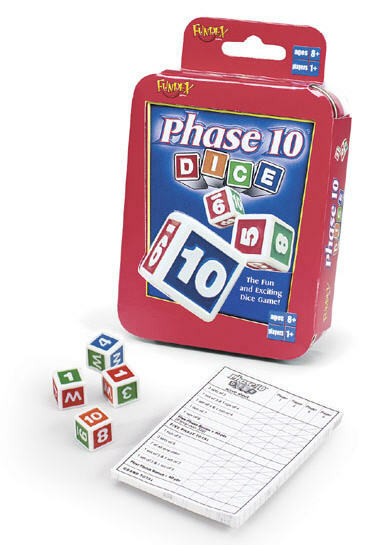 Phase 10 is a dice game that follows a similar premise of Yahtzee, however, there are colors on the dice as well. As you work your way down the score card, you make combinations of numbers and colors... making sets (of the same number/color) or runs (consecutive numbers). Like Yahtzee, there is a bonus, however the bonus in Phase 10 is a first finish bonus. The catch is that once you move on, and start trying to make a match for the next item on the score sheet, you're not allowed to go back and work on previous matches. Excellent game!! Additionally, there are some strategic moves you can discover if you pay attention to the way the dice are number and colored. Fun for everyone!